Place cookie sheet on oven rack. Heat oven to 350°F. In small bowl, beat cream cheese and sugar on low speed until well blended. Add egg; beat well. Stir in orange peel. Set aside. In food processor, place sweet potatoes. Cover; process until smooth. In large bowl, beat sweet potato layer ingredients with wire whisk. Remove crust from freezer. 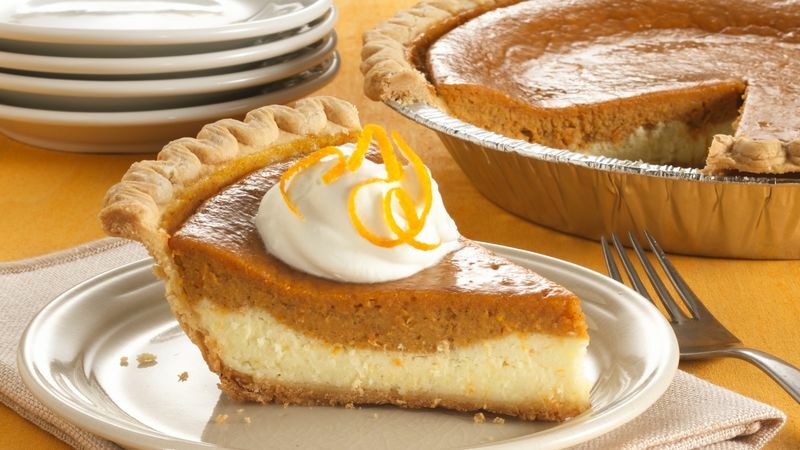 Spread cream cheese mixture in frozen pie crust. Carefully spoon sweet potato mixture over cream cheese mixture. Bake on cookie sheet 50 to 60 minutes or until set and knife inserted near center comes out clean. Cool 30 minutes. Refrigerate until chilled, 3 to 4 hours. Serve pie with sweetened whipped cream. Cover and refrigerate any remaining pie. The cream cheese should not be softened. If the cream cheese mixture is too soft, it could bake into the sweet potato layer.